Contractors: The Vibroplex Co., The Lionel Corp., J.H.Bunnell & Co., Buzza Products, Brooklyn Metal Stamping Corp. The Signal Corps' identification "J-36" was applied to all semi-automatic keys regardless of the contractor or the minor details of construction. 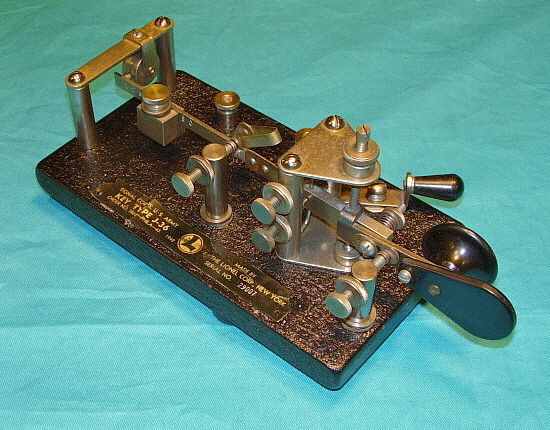 As early as 1930, the U.S. Army Signal Corps began ordering semi-automatic telegraph keys for various uses. The earliest contract appears to have been with the Brooklyn Metal Stamping Corporation who supplied the Army with their "Speed Bug" with the military data plate being about the only change to their standard bug. Although the tag has "Speed Bug" on it, "J-36" is also present. 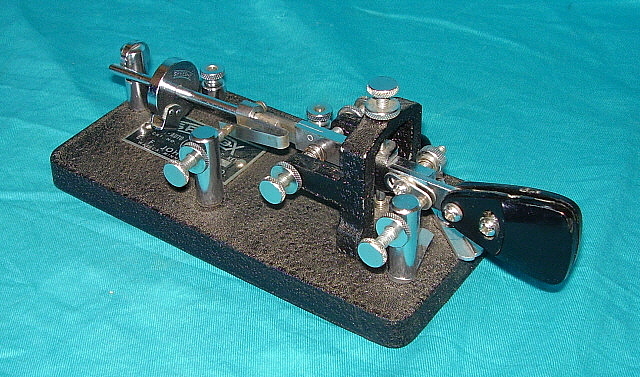 Vibroplex J-36 - Vibroplex began supplying the Army with a speed key that was based on their Lightning Bug around 1935. Except for the data plate, Vibroplex's J-36 is identical to their standard, late-thirties Lightning Bug. The photo to the left shows a pre-war Vibroplex J-36 from Order No. 2844-N.Y.-40. Dated 5-4-40 - Serial Number 548. This J-36 data plate has the 796 Fulton St., Brooklyn, NY address usually found on pre-war J-36 keys. During WWII, the 833 Broadway, New York, NY address was used on the J-36 data plates. There are a few other variations that can be found on different Vibroplex J-36 data plates. The data plates were originally nickel plated brass with the field painted black resulting in the data plate having silver lettering on a black background. Many data plates appear brass-colored because of wear or corrosion and it's possible, with all of the variations, that some data plates might have been unplated brass with a black field. Bunnell J-36 - During WWII, the J-36 production demand required additional contractors. J.H. Bunnell & Company produced two types of J-36 bugs. 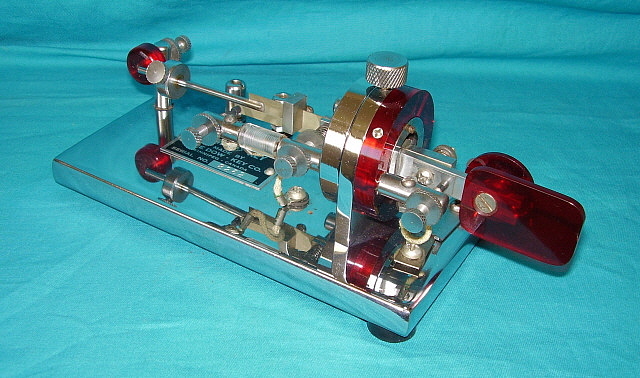 One that uses a main frame that looks something like the early Vibroplex Blue Racer frame, a pendulum and weight similar to the Lightning Bug and a damper similar to a Speed-X key. 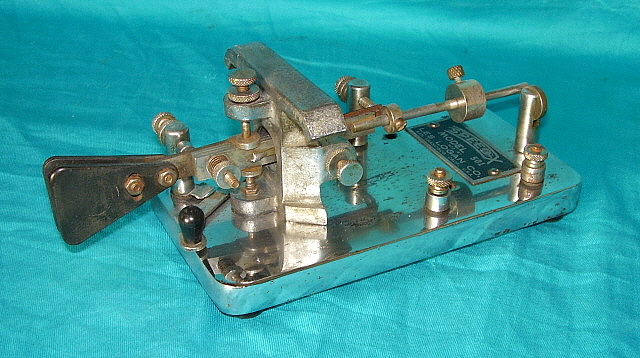 The second type Bunnell is similar but uses a short Vibroplex Original style frame and damper style. The photo to the right shows the Bunnell version of the J-36 with the "Speed-X-style" damper from about 1943. The Order is dated 8-1-42 but the Order No. 8001-Phila-43 has 1943 embedded in it. Serial number on this Bunnell J-36 is sn: 125. 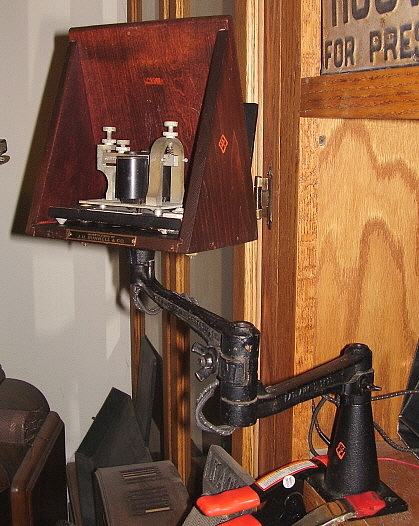 Note that the shorting lever knob is vertical on the Bunnell but horizontal on the Vibroplex and the Lionel. Also note that the base bottom edge has casting roughness that wasn't removed before painting. The entire base is a fairly rough cast and also is heavier and thicker than the Vibroplex or Lionel versions. Also note that the top edge of the base has a pronounced bevel. The data plates on the Bunnell J-36 tend to spot and corrode more than one would expect. Lionel J-36 - Perhaps the greatest quantity of J-36 keys was built by the Lionel Corporation during WWII (shown below-left.) 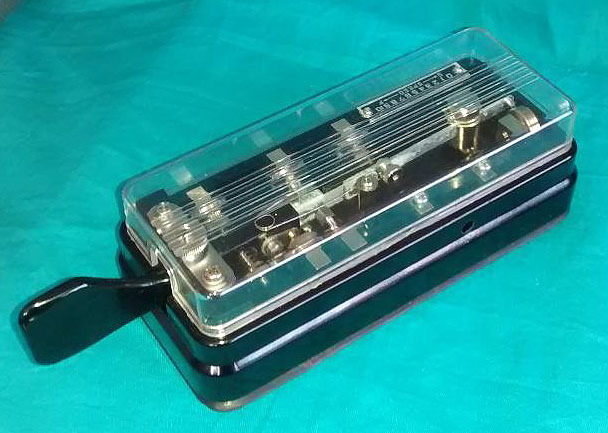 Their version is very close to the Vibroplex Lightning Bug with the only significant difference being the rounded paddle rather than the standard triangular paddle. The plastic identification tag on all Lionel J-36 bugs is always in poor condition with the example shown in the photo being typical of the "better" condition tags (at least it's there.) The plastic was prone to shrinkage and usually pulls away from the mounting pins and breaks. A lot of J-36s are missing their tags entirely. Fortunately, repro tag artwork is available online. Artwork for the Lionel tag is at www.telegraph-office.com proper sizing, printing and plastic lamination will be required. J-36s are great keys to use and provide good action and precise sending. Most J-36 keys will require some rebuilding to function at the level the design is capable of. The Lionel J-36 shown to the left belonged to W3ON. Just about the only bug I've heard being used "on the air" in the past several years have been the J-36. Their military connection has provided a place to use a J-36 on some of the vintage military nets that allow some CW operations. The Vintage Military Radio Net, operating on 3.974mc, allows our "73 round" to be sent in CW if the operator has the equipment and wants to exercise his fist. The Military Radio Collector's Group, operating on 3.985kc, calls for CW stations at the end of the first acknowledgement of the phone check-ins. In addition to Vibroplex, Bunnell, Lionel and the Brooklyn Metal Stamping as contractors for J-36 keys it appears that Buzza Products of Australia also had a contract for J-36 keys during WWII. 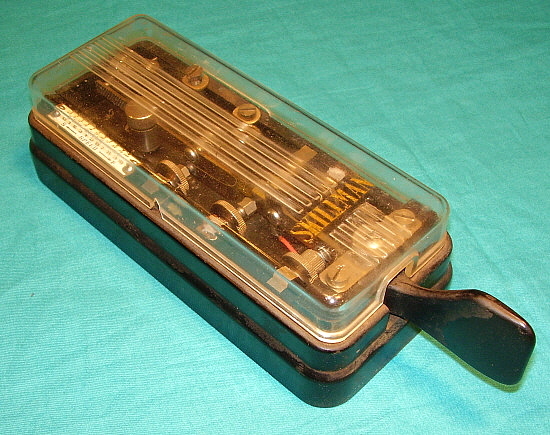 The Buzza version was very similar to the Vibroplex Lightning Bug. The Brooklyn Metal Stamping Corp. "Speed Bug" and the Buzza Products No. 100 Key are profiled next. Brooklyn Metal Stamping Corporation was in business from 1930 up to the beginning of WWII. They were probably licensed by Albright-Vibroplex to build this "knock off" because many of the parts are identical to those built by Vibroplex. The "Speed-Bug" mainframe is an exact copy of the Vibroplex. 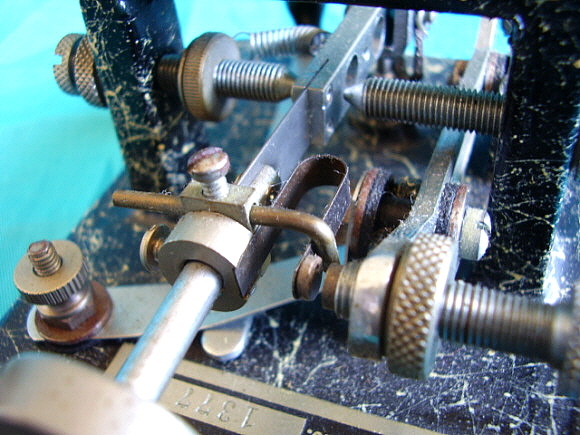 The only significant non-Vibroplex features are that the vertical dot spring contact being "keyed" to only allow mounting in the odd vertical position and the elaborate spring-loaded ball contact damper. A minor difference is the longer main spring that results in a very slow speed with the single weight at the end of the pendulum. Normal sending speeds require the weight to be almost as far forward as the adjustment allows. The other minor difference is the use of a single paddle. I've seen one photo of another "Speed-Bug" with the single paddle but I've also seen a photo of another "Speed-Bug" with a knob and paddle. It's likely that the "Speed Bug" originally came with a knob and paddle set-up. The "Speed-Bug" is fairly scare. Probably dates from the mid-thirties. Brooklyn Metal Stamping Corp. was a contractor for J-36 military bugs prior to WWII (early thirties.) 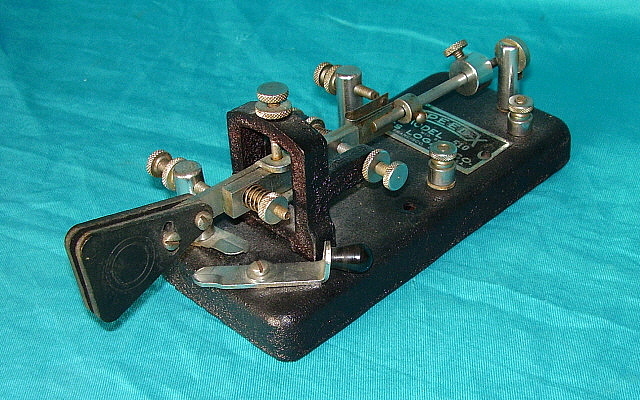 The BMS J-36 is identical to their standard "Speed-Bug" with the exception of the data plate. 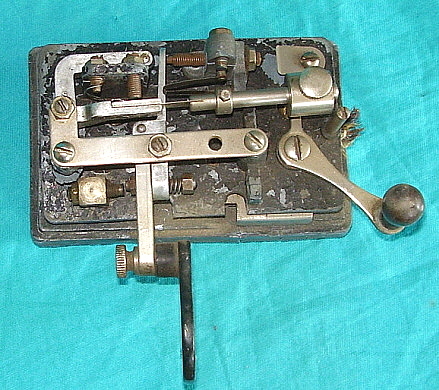 This Australian-made key is based on the Vibroplex Lightning Bug design but changes the support of the dash lever by providing it with its own pivot and bearing. The damper also departs from the Lightning Bug design, requiring fewer parts. All No.100 Buzza keys have a red paddle and a black knob. A very heavy base makes the Buzza a sturdy key to operate and its dot action is very precise. Dates from around WWII. Buzza Products was a contractor during WWII for the J-36 military "Lightning Bug" version. 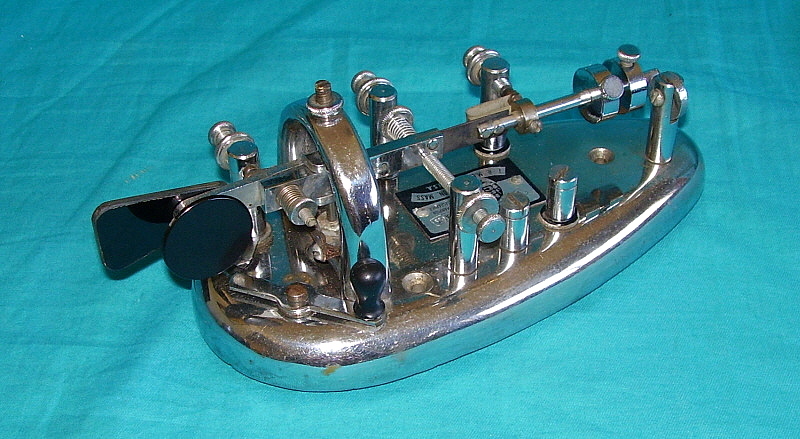 Buzza's J-36 has an appearance that is similar to the Vibroplex or Lionel versions of the J-36, that is, having the damper suspended from a horizontal strap mounted to two vertical round stand-offs. Typical of Buzza though, the paddle will be red and the knob will be black. The Speed-X name is first associated with Electro Manufacturing Co. located in Fresno, California. In 1934, Stewart Johnson bought the Speed-X name and relocated the company to San Francisco. Johnson changed the name of the company to Speed-X Radio Manufacturing Company and the address was 30 Ninth St. in San Francisco. Johnson built Speed-X keys from 1934 until he sold the company to Les Logan in 1937. The Speed-X shown in the photo is similar to the later model 515 Speed-X but with a somewhat smaller base. Earlier Speed-X bugs will have the combination of knob and paddle but the later Speed-X bugs use two paddles instead. Although there is no identification on this bug, it was found in unused condition in its original Stewart Johnson Speed-X box. This is another Stewart Johnson Speed-X bug. This one is nickel-plated and, typical of the Steward Johnson versions, this one doesn't have any sort of identification. However, one can see the similarities that this key has to all Speed-X bugs and particularly those built by Stewart Johnson. Also, a help in identification and dating this key comes from its former owner, Al Norberg W6HLJ, who owed the key from the 1935 until recently. 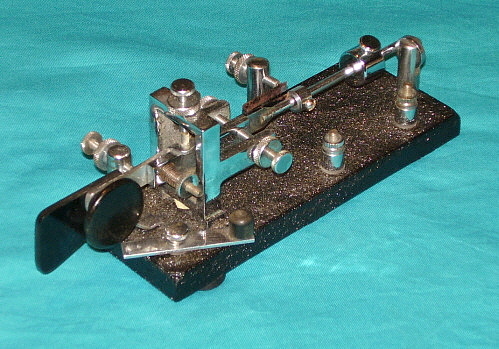 Since this key was used with Norberg's homebrew transmitter that he built in 1935, this key more than likely is a Stewart Johnson version Speed-X. At 97 (2013,) Al Norberg donated his Speed-X key to go along with his homebrew transmitter that he donated to the museum several years ago. 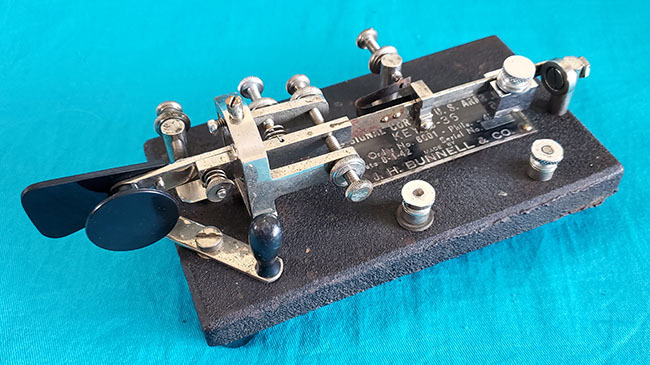 For more information on Al Norberg's homebrew 1KW transmitter built in 1935, go to our "Classic Pre-WWII Ham Gear" page for a complete write up that includes two B&W photos taken in 1936 showing the transmitter, homebrew receiver and this key. Navigation link below. Les Logan purchased Speed-X Radio Manufacturing Co. from Stewart Johnson in 1937. Logan dropped "Radio" from the name, changing it to Speed-X Manufacturing Company and the location was moved to 646 Jessie St. in San Francisco. Les Logan's name is usually associated with Speed-X from 1937 up to 1947. Logan changed a few things on his keys compared to those of his predecessor (Stewart Johnson.) Logan finally added an identification tag to his keys along with a model number. Logan's bugs use two paddles rather than a knob and paddle combination. He also offered a couple of different types of bearing support frames on his different models. The "T" handle was available on the larger Logan bugs and supposedly allowed the user to set the bug on its side and use the dash paddle as a straight key. Les Logan's bugs were well-built and quite popular. Les Logan sold the Speed-X line to E.F. Johnson Co. of Waseca, Minnesota in 1947. This Model 500 belonged to John Ridgway W3ON. Les Logan's Speed-X Model 501 was the nickel-plated version of the Model 500. Dates from the late-thirties. The Model 510 was Les Logan's small key that was priced well-below the larger 500 models. As a cost cutting measure the base of the 510 is made out of "pot metal." This makes the bug very light-weight although that probably wasn't the intention. Luckily, by the mid-thirties the process for casting pot metal had improved dramatically from types of castings found a decade earlier. The pot metal base of the 510 is in very good condition although there is some very minor cracking along the bottom edges. While noticeable, the pot metal isn't fracturing or showing any other signs of "pot metal disease" otherwise known is "stress corrosion." For an example of how pot metal of the mid-twenties behaves, take a look at the "73" Bug further down this page. This Model 510 came from K6QY. The Model 515 was Les Logan's big seller. It's the standard key that was probably priced very competitively and therefore became very popular. The Model 515 was about the same size as Vibroplex's Blue Racer but, unlike the Racer, the 515 can send fairly slow Morse. The reason is because of the longer main spring used. The main spring is the spring-blade that connects the pendulum rod to the main lever. The thickness and the length of the main spring will determine the flexibility of the pendulum and therefore the slowest sending speed that can be achieved with the given weights. This Model 515 belonged to W6EYC. E. F. Johnson Company of Waseca, Minnesota became the last manufacturer using the Speed-X name. Johnson purchased Speed-X from Les Logan in 1947 and initially continued to produce basically the same type of keys. Eventually, a different weight design was used followed by a change in the fiber paddles to plastic. The last of the Johnson Speed-X bugs have chrome plating, different tags and other minor hardware changes. The bug shown probably dates from the early 1950s. This bug belonged to K6QY. The Cat. No. 114-500 was the standard version of the plated bug shown above. The base and frame are painted black wrinkle finish and the hardware is chrome plated. 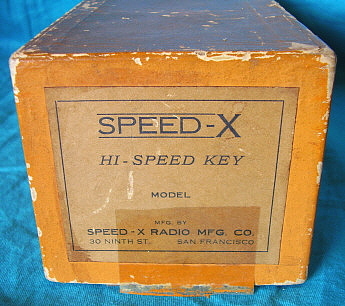 This Speed-X key was found in its original box in unused condition - the two paddles weren't even mounted to the lever. What was interesting was where I found the key. I always have made it a point to go to the Hot August Nights annual car swap meet held in Reno. I even went to it when it was called Harrah's Auto Swap. Hot August Nights has always seemed to produce something radio related over the years. I've found several telegraph keys there many times. Well, this Johnson 114-500 was at HAN swap probably around 1995 or so. I had actually been through the entire swap and was standing beside a table that I thought I had already looked at. I was thinking if there was anywhere else to look in the swap area. I happened to look directly down at the table that I was standing right next to and I saw a familiar-looking orange box with a blue label. I wondered if the bug was actually inside. I was amazed when opening the box I found that the bug was untouched, never used, in mint condition. I didn't even have to ask the dealer what the price was, he came over and volunteered that information. Money quickly exchanged hands ($30) and I had the bug. At home, I mounted the paddles with the hardware provided in the box. Unusual that the bug was never used and is still pretty much that way. This is Johnson's version of the old Les Logan Model 515. This particular example has the later plastic paddles installed. Also, note the phillips head screws. This bug probably dates from the late-fifties up to the mid-sixties. McElroy Manufacturing Corp., aka: T. R. McElroy "World's Champion Radio Telegrapher"
Ted McElroy was a champion radio telegrapher having gone through the Candler system of learning International Morse code. His receiving speed was advertised as 55wpm in the mid-thirties but ultimately Ted was clocked at over 70wpm. In 1937, McElroy began producing the MAC key. It used a heavy cast iron base that featured a "T bar" frame. Supposedly, the key could be turned on its side and used as a hand key. The damper utilized a loosely mounted thick metal disk and arm that was adjustable in height. The MAC keys were available in black wrinkle finish and the Deluxe versions had a "marble" finish. Some of the Deluxe MAC keys will have a dot-spring pre-load installed. This adjustment would "load" the dot spring to have more "stiffness" and reduce contact bounce. The Dot Spring Pre-Load is shown in the close-up photo to the left. Note that the rod is adjusted to slightly compress the spring which will reduce its flexibility making the dot contact less likely to bounce and result in more precise dot streams. The Deluxe Mac Keys were made in this style with the metal identification plate from around 1937 up to about 1940. The Deluxe Model 600 shown features the same type of "marbled" finish that was found on the earlier versions of this key. The marble finish resulted in a key that was striking in appearance and the finish was very durable. This version of the Deluxe MAC key started to be produced around 1940. The decal labels replaced the large metal identification plate used on the earlier MAC keys. Also, the dot spring pre-load is usually not found on these later keys. The Deluxe Model 600 sold for $9.50 in 1940. All of the McElroy MAC keys are heavy, well-built units. Key contacts are large and all of the hardware is heavy-duty. When in good condition and well-adjusted, the Deluxe MAC Keys have a comfortable action and can send CW very accurately. Ted McElroy's "Stream" keys featured a Zephyr-styled, "teardrop" shaped base that evoked the era of speed and rapid movement. 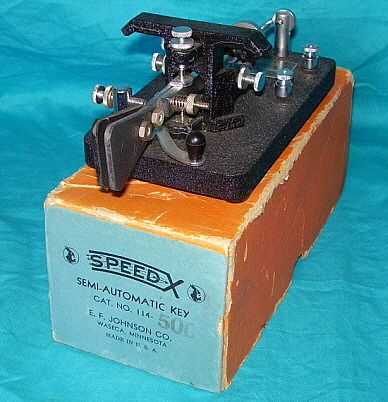 Both the "Stream" hand-key versions and the "Super Stream" semi-automatic key used this style base. Introduced around 1941, the S-600 was chrome plated as were some of the "Stream" hand-keys. The Super Stream was given the model number S-600 but it isn't located on the tag or anywhere on the bug. The name Super Stream doesn't appear on the tag either. The Super Stream S-600 appears small in photographs but the key is quite large and very heavy which helps it stay in place when sending. It's a stunning key that, if adjusted properly, has a wide-range of sending speed and is comfortable to operate while providing a very precise dot-action. The fact that the key "stays put" on the bench really helps sending accuracy. Of course, any bug could be mounted to the bench with screws to keep it from moving around but the Super Stream S-600 does so just by having most of its weight at the front of the base. Ultimate Transmitter Company was located in Los Angeles, California. Their semi-automatic keys were merely called "73." These bugs are very small and work by way of a bell-crank that allows actuating the vibrating pendulum from a right-angle mounted key lever. Adjustments are accessed inside the key mechanism after removing the metal cover. These keys were made in the 1920s and the patent date on this particular one is "6-23-25." Unfortunately for collectors, the "73" bugs were built on pot-metal bases with pot-metal upper cover and lower sub-base. During the 1920s, the pot-metal process was primitive and contamination of the mix affected nearly all pot metal cast products. The material degraded rapidly with a process called "stress corrosion." The result was warping, chipping, cracking, distortions,...on and on. Note the cover on the "73" bug shown to the right. Large chips are obvious and also note the cracking on the base and the stress cracks all over the top of the cover. Almost all pot-metal made in the 1920s will today be found to be victims of stress corrosion. 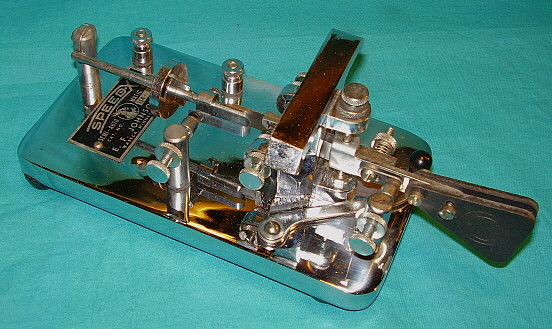 As can be seen, this example of the "73" bug is a victim of severe "pot-metal disease" that not only affects the top cover and base but also affects the pot metal sub-base that the key mechanism is mounted to. The distortion is not too obvious at the angle of the photograph but the "bent" sub-base doesn't allow the mechanism to be in alignment and therefore accurate adjustment is not possible and this means the key really doesn't send properly - or, at least as well as the "73" bugs did when they were new. Originally the "73" bug had two paddles to allow a good feel to the actuation of the mechanism. With the other problems this example has, the missing paddle seems minor. The key cable exits from under the sub-base and exits on the right side of the main base. Also, the shorting lever is on the right side of the bug. Several examples of the "73" bug seen on the Internet have painted exteriors. The sub-base on this example appears to have been painted black. The exterior shows no sign of paint but, given its condition, that's not surprising. The "73" bug was a very clever design that probably worked very well when the keys were new. Unfortunately, the material used for their construction was not stable and that resulted in a short useful life for the key. That's probably why the "73" bug has a relatively "unknown" status today. The Kenmore Company was located in Boston, Massachusetts. They built a couple of types of semi-automatic keys that were sold through Boston's "Radio Shack" store. Boston's "Radio Shack" was a large ham radio dealer, selling all types of ham gear from new and used receivers and transmitters to all types of radio accessories. The Kenco Key was an inexpensive bug that was built onto a 0.125" thick piece of black formica. All of the key components mount to this thin formica platform that is in turn mounted with four screws to a cast iron, welled, base. The "well" of the base allows for clearance for the wiring of the dot and dash contacts to the connection terminals all accomplished under the bakelite platform. The Kenco Key has two levers. The dash lever operates directly while the dot lever is operated by the dash lever pressed in the opposite direction. Each lever has its own bearings. The main frame, damper, dash contact mount and dot contact mount are all made from cast pot metal that's painted black wrinkle finish. The pendulum rod is extended past the damper allowing the weight (or weights) to be placed at the end of the pendulum rod (providing very slow dot action) or in front of the damper for faster speed. Despite its rather cheap construction the Kenco Key does send very good Morse and it's comfortable to use. Kenco Keys date from the late-thirties up to about WWII. >>> A few years later and the keys were carrying tags indicating they were made in Warren, Minnesota with Winnipeg listed as the distributor for Canada. Paul Dow retired in 1956, leaving the operation of Dow-Key to his son, Gordon. Paul Dow died in 1957 and in the same year, Gordon moved the company to Thief's River Falls, Minnesota. 1957 was also the last year that Dow Key made speed keys. The Dow-Key Company had been slowly changing and adding to the product-line with RF switches becoming their specialty. The Dow-Key coaxial relays are probably the best known to hams of these types of products. Dow- Key has had several owners but is still in business building various types of RF switching devices. How it Works - The Universal Rotary Key uses a tubular, flanged housing in which the main lever is mounted. The trunnion bearings are adjustable both top and bottom. Once the main lever is mounted in the tubular flanged housing this assembly can be inserted from the backside though the vertical base mount and lightly secured with the knurled thumb screw. Then the red plastic retaining ring with dash contact mount is placed over the protruding portion of the flanged housing. The red plastic retaining ring is secured by lightly tightening the two philips head screws. To rotate the entire flanged housing and main lever the knurled thumb screw is loosened and the mechanism rotated to the desired angle and then the thumb screw lightly tightened to secure that position. Note that the dot contact is mounted with a clear plastic standoff on the backside of the flanged housing. Note that the connections to the dot and dash contacts are via flexible wires. This is to allow unhindered rotation of the mechanism. Total movement is about 270º with vertical being the halfway point. Though it's possible to rotate the mechanism all the way CCW and maybe use the dash contact side as a straight key, the mechanical limits don't allow rotation to a completely horizontal position. Besides, it was never the intent of the Universal to double as a straight key. A fully adjustable, comfortable-to-use, speed key were the design goals of the Universal. 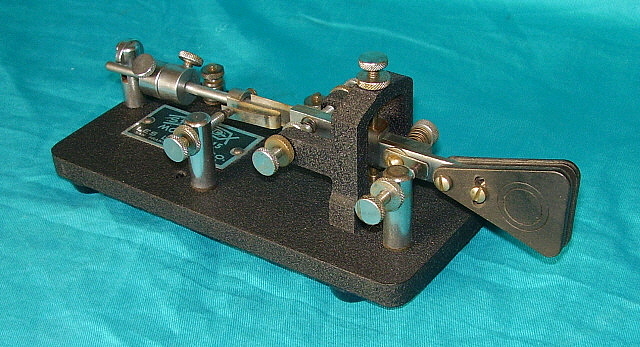 The Deluxe Universal Rotary Key shown is from the very early fifties. It has a tag indicating that it was built in Winnipeg, Canada. The Deluxe Universal is a striking key with its transparent red plastic, transparent clear plastic and chrome features. The precise machining of the various pieces results in a very smooth rotation when adjusting the sending angle. The Dow-Key Deluxe Universal has a very wide range of speed and, since it can be set up to any angle of operation, it's the ultimate in sending comfort. I've tried different angles and Paul Dow was actually "on to something." For me, a slight angle CCW does feel nice. You do have to readjust the contacts slightly if the angle change is dramatic but it's not necessary for small changes. I've noticed that sometimes one will see a standard bug that has a slight "twist" in the front part of the lever (like the Buzza.) I guess that was one way to get a comfortable feel. Electrical Specialty Manufacturing started making bugs in 1936. The company was located in Cedar Rapids, Iowa which has resulted in their key being given the nickname "Cedar Rapids Bug." Electrical Specialty's methods of manufacture and their parts didn't change a lot over the years. Minor changes the damper design and in the cast base having four feet on early versions and five feet on later versions are the most often cited. The rubber bumper on the damper is another unusual feature. The company name is cast into the bottom of the base. The Cedar Rapids Bug was perhaps the only semi-automatic key that was offered either in assembled form or as a kit, (the price difference was minimal.) Since many were assembled from kits, builders sometimes took liberties with custom paint jobs and special hardware. The example shown in the photo is the "standard" Cedar Rapids Bug (ca. 1947.) Electrical Specialty is still in business but they quit making bugs in 1957. NOTE: The paddle looks squared-off and unfinished but this is an original paddle and knob and shows how the standard models looked assembled without modifications. Of course, since these bugs were kits, original owners might have "shaped" the paddle to their preference or added other "custom" features to the bug. This type of bug was sold under many different names by several different dealers including many of the catalog dealers, like Lafayette or Allied. The Japanese company Dentsu-Seiki was the probable manufacturer of the keys. Hi-Mound, Monarch, Skillman and Calrad were just some of the names used by the various dealers. The Calrad version was identified as "T.K.12" on the packaging. Monarch's key was identified as "KY-102." Hi-Mound was the BK-100 (photo right) when sold by Lafayette. The BK-100 does have a rubber "suction cup" (full size) base pad that adheres to table surfaces quite well. Skillman was one of the few versions with a name on the plastic cover (the only one I've seen.) Most versions will not have any name on the cover or the key. These bugs do seem to function quite well although the adjustments are a little hard to get at. Also, many of the plastic covers were fragile and most, if even present, will be found in poor condition with scratches, cracks or broken pieces. 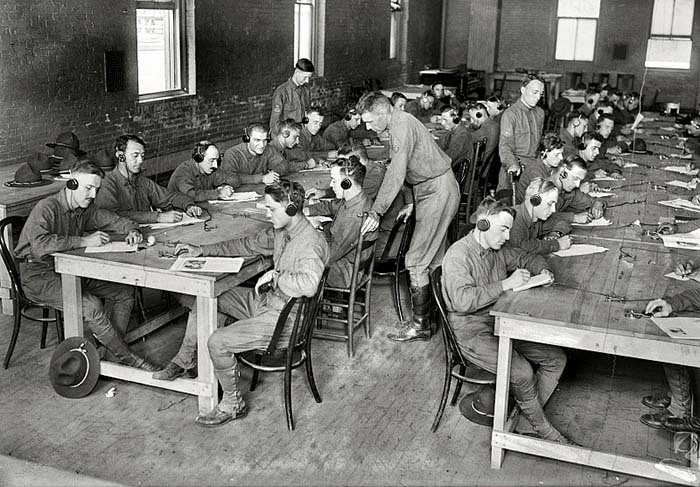 When the USA became involved in WWI (April 1917) the Army and Navy realized they were going to need wireless operators in the field and on ships at sea besides the trenches. Training time would be shortened if the men enlisting already knew International Morse Code. What better way to learn the code at home than by phonograph record. 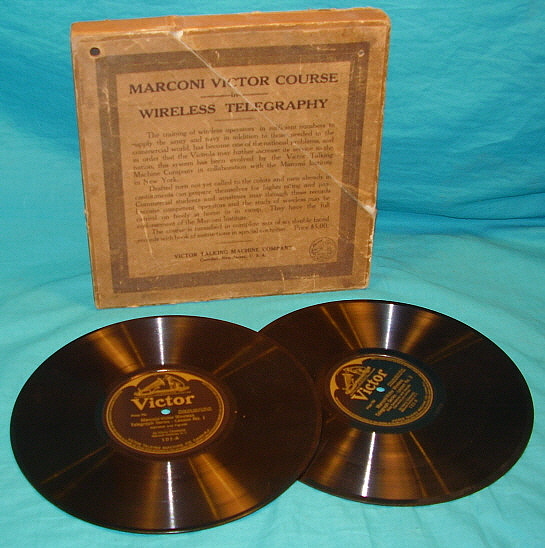 The Victor Talking Machine Company offered a six record set along with booklet in 1917 to assist the military in providing a method to have future enlistees already know the code. The records are 10" diameter and are acoustically recorded, that is, all the speaking and the code "buzzer" were performed before a large horn that directed the sound energy down to a record cutter that made the master. The sound of the transmitted code signals sounds like a rotary spark gap type transmitter but is probably a large mechanical buzzer. In the first record for learning the alphabet, the announcer yells "A" and then the buzzer is heard to send "dit dah" at about a ten wpm speed. Then the announcer yells "B" - "dah dit dit dit" from the buzzer. This same format is used for learning the letters and numbers. The records progress from learning the code on the first record and then on to building speed up to full messages sent on the last record. Recordings have been used to learn International Morse for years after this Marconi-Victor course. Several companies issued records over the years. Many hams remember the Ameco Code Course records. When I was a teenager, I learned the code from an Ameco Code Course LP record that I checked out of the local library. The recording medium went to tapes and then CDs. Computer programs have also been instrumental in instruction and building code speed. Learning to receive International Morse was certainly the most difficult part of the task. But, learning to send Morse and to be able to "handle a key" was also very important. It required tools like the following equipment. These wooden board key sets (called KOB, key on board) were popular on land lines as methods of communication within large buildings or other similar applications. 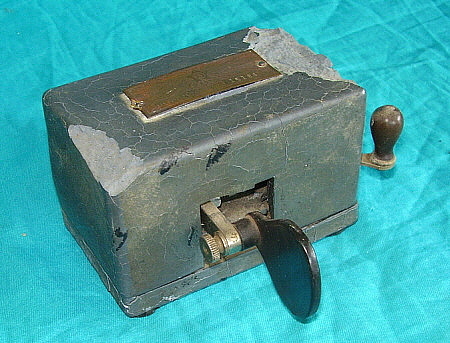 The early types had a hand key and a sounder that would allow sending and receiving along a local line interconnected with other KOBs and a voltage source. These early types were also used for learning and practicing American Morse or Railroad code within applicable classrooms. 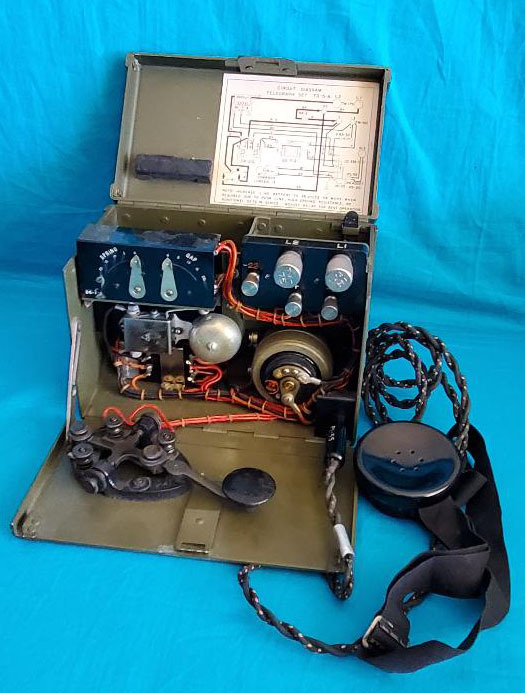 With the evolution of radio and its use of International Morse requiring the reproducer to work with "dots and dashes" rather than "clicks and spaces" the KOB units were also built with an electrically operated buzzer rather than the sounder. 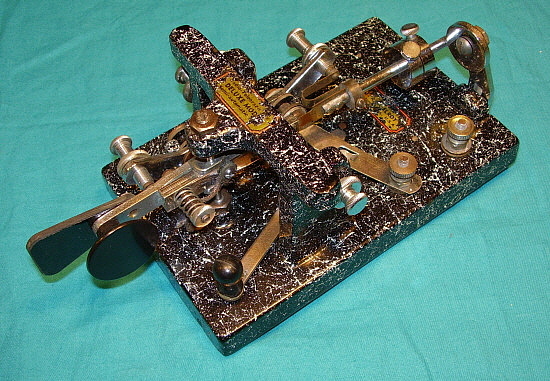 The buzzer allowed producing the "dots and dashes" of International Morse. 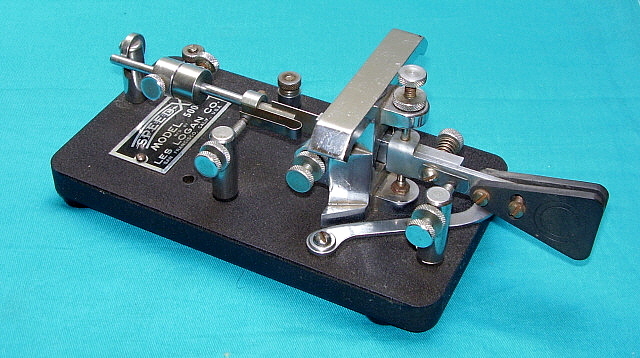 The buzzer type KOBs were traditionally used for learning or practicing the code although it was possible to interconnect two or more sets for local wire communications. 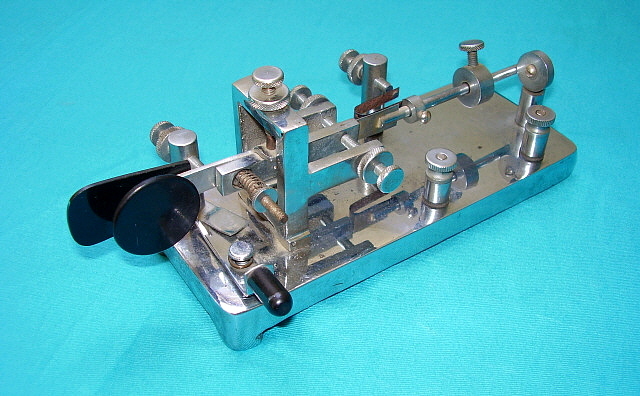 Most were interconnected and used in "radio schools" and military radio schools for classroom Morse send-receive education. KOB-type buzzer practice code sets were popular from the WWI era up to the fifties. Later types are plastic and are sometimes toys rather than actual learning tools as the R-68 shown was. The metal tag between the key and buzzer shows International Morse Code. The R-68 shown is probably from the WWII-era. Code Practice Oscillators were used for several purposes. First, when two or more people were trying to learn the code or were trying to improve their sending ability, the Code Oscillator allowed one person to send while the other received. The positions would be switched after a while to allow both individuals to send and receive. Unlike the buzzer practice sets, the Code Oscillators sounded more like a true CW signal (well, it depended on the oscillator) and probably made the transition to an actual "on the air" copy easier. These Code Oscillators could also usually be connected to the ham transmitter to act as a sending monitor - to make sure that your sent CW had the proper spacing and rhythm. The tube used was generally a 117L6 which was a diode rectifier and pentode in one envelope. Usually the speaker was a Hi-Z armature-pin speaker. Most had the option of using a headset for monitoring. Pitch of the tone was adjustable. Another use for the Code Practice Oscillator would be for those hams who would volunteer as examiners and would administer Novice exams and sometimes Conditional License exams. Obtaining a Novice License before 1980 required that the prospective ham to go out and find a licensed General Class or higher ham who would volunteer to give him the 5 wpm Code test. The first step was to for the volunteer examiner to obtain a 610 form from the FCC. Those forms used to have a section for the examiner to fill out confirming that he had given a 5 wpm Morse Code test to the applicant and that he had passed both sending and receiving. The requirement was to have at least one minute of solid copy and one minute of solid sending. Next, the volunteer examiner would send in the completed 610 form to the FCC. Six weeks later, the examiner would receive the applicant's Novice written test via the mail at which time he would contact the applicant to come over and take the test. The completed test was sent into the FCC again and hopefully, six weeks later, the applicant would receive his Novice license and call letters (again, via the mail.) This arduous and lengthy procedure started to change as the ARRL Volunteer Examiner program was started in the 1980s. As both the code test and the written theory test could be administered on the same date the time to acquire the license was reduced. Over time, the FCC has greatly improved their turnaround time on license processing also. Today, temporary license permits are issued upon successful completion of the exam, the new licensee will show up on the FCC website in a few days and the "hard copy" license can be printed from the FCC website.. 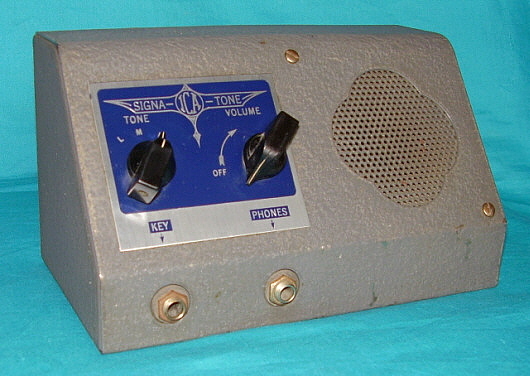 Shown in the photo top right is the ICA Signa-Tone (ICA was the Insuline Corp. of America.) This is a very nice performing Code Practice Oscillator with a variety of tones and strong volume. 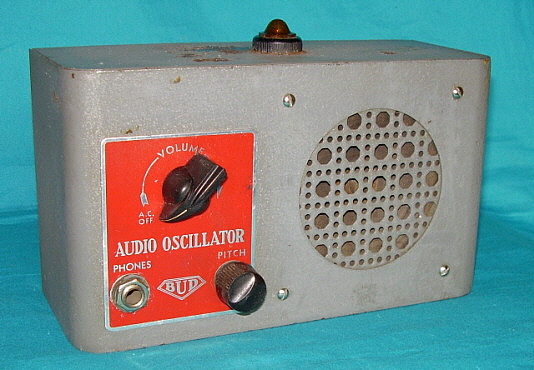 The Bud Audio Oscillator is very similar in design to the Signa-Tone and dates from around the same time period - the late-forties to mid-fifties. Bud Industries is famous for their metal cabinets and metal relay racks. Bud Industries has been in business since 1928. 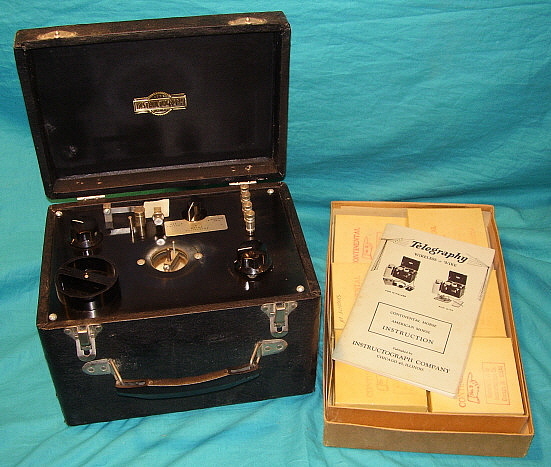 Shown in the photo to the right is a fairly early Instructograph that uses a wind-up motor to drive the tape pickup spool. Note that one this early version, the tape spools are made of wood. Also, the tape containers are metal tins with "Continental" printed on the lid. Each tin is numbered for identification. Note also that this machine has a small pointer knob at the upper left of the panel. This is the power switch and volume control for the battery-operated audio oscillator that is mounted inside the cabinet. The oscillator uses a single type 30 vacuum tube. This excellent condition Instructograph is complete with all of the tapes, extra spools and a spare type 30 tube. It belonged to W3ON. Instructographs and the FCC at San Francisco - Instructographs used to be everywhere. A lot of hams had them. Even the FCC used them to give the code tests to hams. The 13 wpm code test I took from the FCC in San Francisco in 1970 was sent with an Instructograph machine. When administering the code test, the FCC engineers would deliberately try to increase your nervous apprehension and level of discomfort to see if you really "knew" the code and could copy under difficult conditions. Typically unfriendly, the SF-FCC engineers communicated to ham-test, license upgrade-applicants with terse verbal commands along with various facial expressions that were supposed to highlight the dubious likelihood of any applicants passing the CW test. If you did pass the SF-FCC CW test, you could copy CW in the worst environments. In contrast, in the late-eighties I took (and passed) the 20 wpm code test for Extra Class. The CW test was sent using a cassette tape machine by a VE (volunteer examiner) who did everything he could to increase the comfort level and reduce any test nervousness. "Do you need a pencil? Is the volume okay? Would you like a cup of coffee?," were some of the questions designed to reduce "test nervousness." Quite a difference from the brusque manner of the FCC engineers. At that time, the VE-CW test included submitting my "hard copy" along with a ten question, "fill-in-the-blank" written test. Around 2000, the CW qualifications for Extra Class were reduced to only the beginners level of 5 wpm. Eventually, CW requirements were totally eliminated for Extra Class and all other levels of amateur licensing. How times have changed. photo left: This is a late Instructograph that runs on AC and has an internal solid-state audio oscillator. Note the larger box provided for tape storage and instructions. The following is just a very small sample of the vast amount of Landline Telegraph Equipment that was produced. 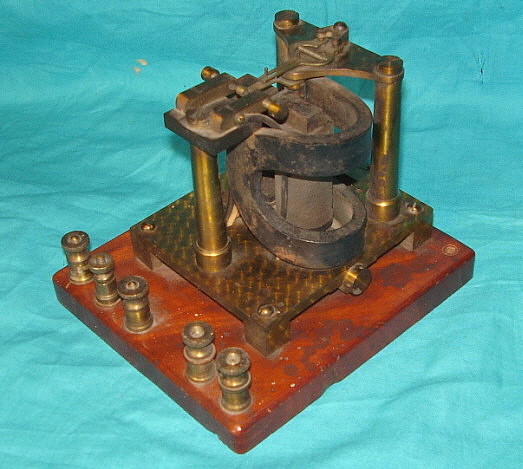 The earliest telegraph gear will be for wire landline use going back to as early as the middle of the nineteenth century. Most of what we find today dates from the early twentieth century. 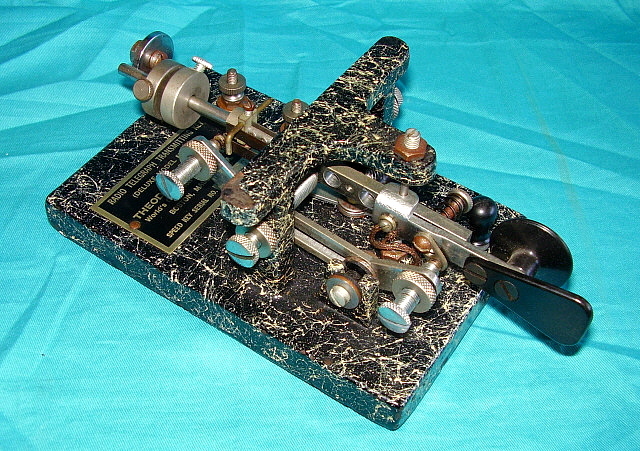 Landline used American Morse Code which was a slightly different code when compared to the later International Morse Code. Aurally the two codes are completely different with International operators hearing "dits and dahs" in sine wave tones (hopefully) while the American Morse operators hear "clicks and spaces" from a sounder. The sounder is the "receiver" of the wire telegraph. Originally the "Morse Register" was a mechanical method of receiving the code but operators soon found that they could "read" the code directly from the aural information heard as the machine operated. 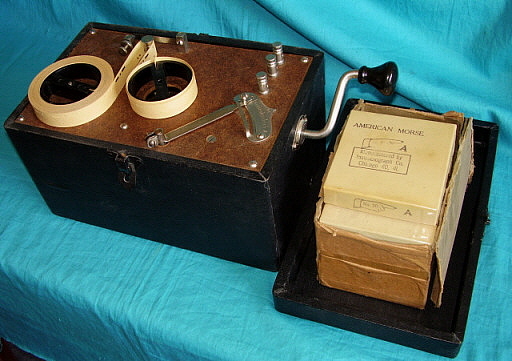 This led to Morse's associate, Alfred Vail, building a device that allowed the operators to hear the code directly. 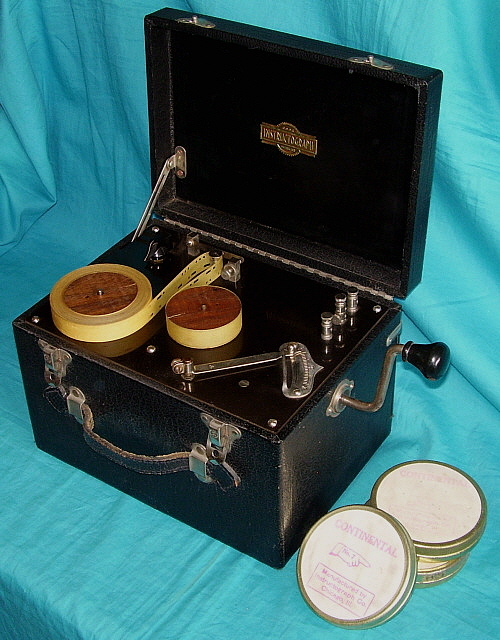 The sounders were sometimes installed into resonator boxes to amplify the clicking sound produced. Sounders are rated by the DC resistance of the solenoids. The DC resistance determined the maximum distance between two stations where the sounders were connected directly to the line and were powered by the battery DC voltage source. The greater the distance between stations, the higher the DC resistance of the wire was and therefore the greater the voltage drop if the sounder solenoids were of a low DC resistance. Sounders were produced from the mid-nineteenth century up into the 1960s or so. Otis C. White was located in Worcester, Massachusetts and specialized in cast iron, articulated arm mounting devices, mainly for lighting for desks and machines. The use of the articulated arm allowed the operator to position the sounder resonator box for best listening depending on the noise and activity in the station area. Active use is probably later than the patent date that is on White's arm, which is 1911. The actual use date of this one shown is probably in the 1920s or 30s. Obvious are the U.S. Army Signal Corps acceptance stamps implying the military use of this example. The sounder used was built by Bunnell and has both solenoids wired to individual terminals. This allowed the user to connect the solenoids in series or parallel depending on the line distance. Each solenoid measures 200 DC ohms so a series connection results in 400 ohms and a parallel connection results in 100 ohms (although the tag indicates "18-400 ohms.") A metal Western Union (W.U. TEL. CO.) tag is mounted to the sounder base implying that WU may have been supplying the Army with their telegraph system in this particular case. The resonator box is also built by Bunnell and it has a cast metal rear bracket that was probably for paper "messages to be sent." It's likely that several million sounders were built over the years from the mid-1800s up to the mid-1900s. Every railroad station had to have several. Sometimes the local telegraph office was at the local post office. Other times there was a specific "telegraph office" in the town. Then there were the many other users that included inter-office communications (pre-telephone) in large buildings or building complexes. The local users had the 4 ohm sounders. These were just about the lowest DC resistance available and allowed for very short distances on direct wire operation using a couple of gravity batteries as the voltage source. It was also common to use the 4 ohm sounders in conjunction with "sensitive relays" that allowed the relay to operate greater distances on the line and then to operate the sounder as a local device. Some of the 4 ohm sounders were for instructional devices since this was about as "local" as one could get. Patent date on this Bunnell sounder is May 7, 1895 but it probably dates from much later. Western Electric was the manufacturing arm of American Telephone and Telegraph Company. 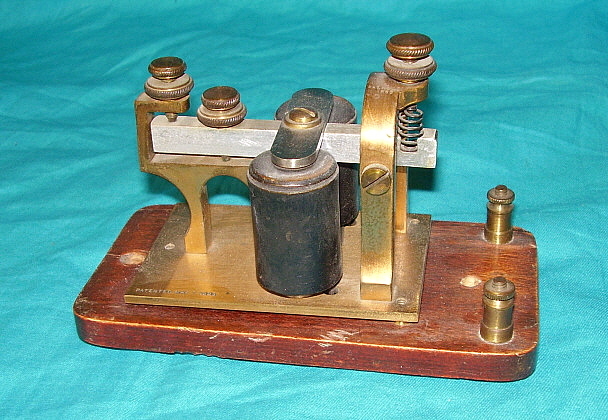 They made many types telegraph devices such as keys and sounders along with other telegraph equipment. Western Electric was the W.U. competition. Western Electric and Bell backed the telephone over the telegraph which seemed to favor W.U. at first. As the telegraph gave way to the telephone, W.U. lost substantially and they were eventually bought by the Bell System in the late twentieth century. 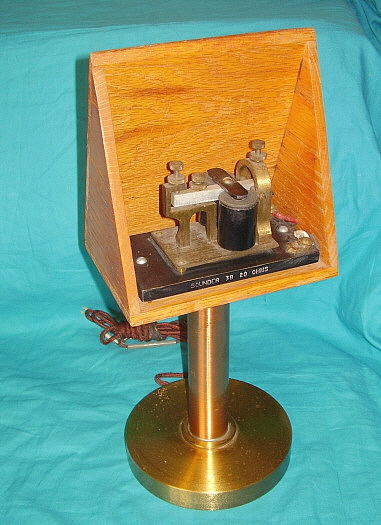 This is a Western Electric 3B 20 ohm Sounder mounted in an oak resonator box mounted on an impressive brass pedestal. DC Resistance versus actual distance has a few variables. The voltage source was determined by how many batteries were being used. The potential available would be an important factor in distance covered. Although it's not really specified what voltages were used, it probably was between 50vdc and 150vdc. The size of the wire determined the DC resistance per foot of the line between the two stations. The distance between field poles determined what type of wire and what diameter wire was used and that determined the DC resistance per foot. Sounders were normally energized and the entire line was normally a complete series circuit. Each key had a switch that was kept closed when all stations on the line were in the "receive" mode. 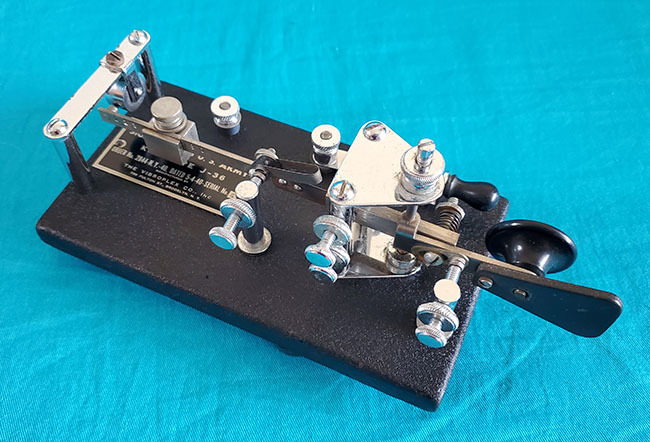 To send, an operator would "open the key" and that would drop out the sounders at which time the operator would begin sending his message and that operated all sounders on the line. When finished, he would "close the key" to keep the circuit energized. All of the sounders on the line presented a "series load" that was the DC resistance of the all of the solenoids added up. Each line had to have the total load calculated to keep the system capable of operating while taking into account all of the other variables that might happen along the line. The higher the total resistive load on the line, the lower the voltage drop across the line and the longer distances can be covered by the system. 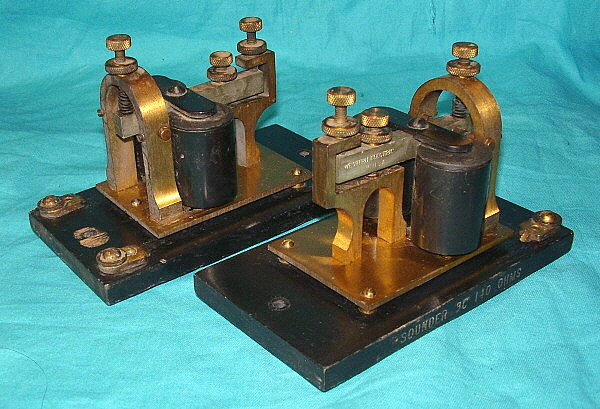 Western Electric 3C 140 ohm Sounders would be for long distance operation direct on the line. Initially, Morse's system used two wires but very soon it was discovered that a single wire could be run between stations and each station could use an Earth ground for the return. Each station had batteries for the potential and large surface area metal plates were buried to provide a substantial Earth ground. With low DCR sounders drawing more current to operate the voltage drop across the single wire increased to the point where the sounder wouldn't operate. High resistance sounders didn't draw as much current and therefore could operate for greater distances before the voltage drop increased to the point where the sounder wouldn't function. The system depended on how many sounders were in series on the line. Fewer sounders would require each solenoid to have a higher DCR. 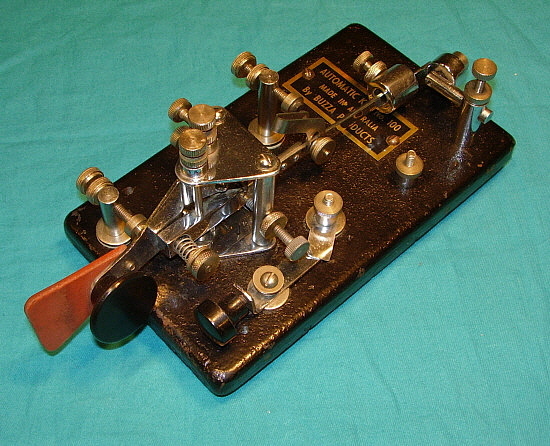 Most stations would use the low DCR sounders on a local circuit within the station and the line(s) would be operating high DCR Telegraph Relays. When great distances had to be covered, sounders generally weren't operated directly on the line. A sensitive relay used high DC resistance solenoids to operate a set of contacts that could operate a local circuit which had low DC resistance sounders. The DC resistance on this relay is 50 ohms which allowed it to operate greater distances between stations. There is an extra switch circuit to the right probably for opening or closing the wire circuit. The switch contacts go directly to the two terminals on the right end of the relay. Lifting the red knob opens the switch. The middle terminals are for the local line connection and the left end terminals are for the wire line input but may have been wired to include the switch circuit. The manufacturer of this beautiful device is unknown. There isn't any builder identification anywhere. This relay probably dates from the early twentieth century. The builder of this beautiful Polar Relay isn't identified. The two solenoids work in conjunction with the "wrap-around" horseshoe magnet. The contact arm remains stationary between the N and S contacts if the solenoids aren't energized. If a connection is made to the two input contacts that is positive then the arm will move to the N contact. If the opposite polarity is made to the input contacts (negative) then the arm will move to the S contact. The connection labels are arbitrary and dependent on the hook up and system. The basic function is that the change in polarity between the two input contacts results in the selection of either arm to N or arm to S with those terminals being the three grouped together on the left side of the board. The input terminals are the two grouped on the right side of the board. 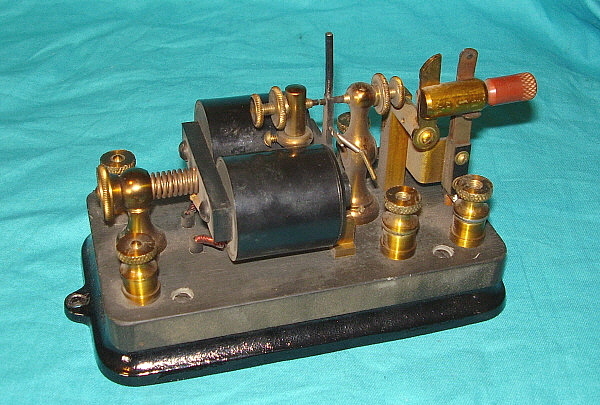 The polar relay worked with a different type of telegraph system called the duplex circuit that could run multiple signals on a single wire. This evolved into the quadruplex system the used polarity changes for additional signals on a single wire. This polar relay is beautifully made with turned finished brass sub-base and a mahogany wooden base. It probably dates from around 1900. This is an early Instructograph with wind-up motor drive. Note that this version has a removable lid that is held on with two latches. Note also that the tapes are for American Morse. I'm not sure about the masonite panel. It appears to have wear and looks original but I've never seen masonite used as a panel on any other Instructograph. Note that this version doesn't have a knob anywhere on the panel. This indicates that the machine has no internal, battery operated audio oscillator. This implies that the machine relies on the user to provide an external indicating device. Since the tapes are for American Morse the reproducer should be a sounder and battery combination. Contractor: The Allen D. Cardwell Mfg. 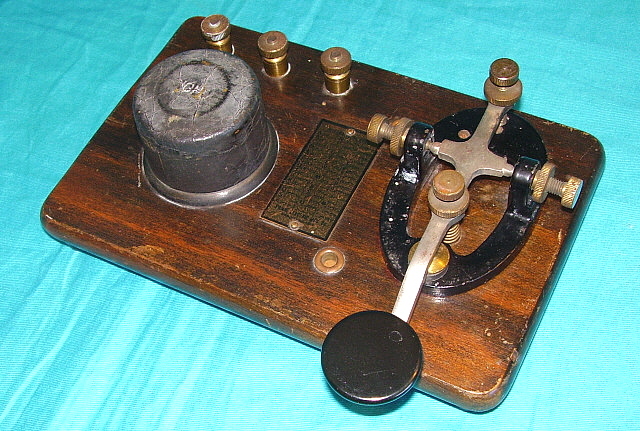 Corp.
Telegraph Sets were used for various types of communication where wires had been placed between the points that were sending and receiving. The distance covered depended on the voltage used, condition of the wires and, if an earth return was used, then the ground conductivity was important. Internally, a three volt DC battery source can be used. Also, the three volts can be connected externally, if necessary. If the bell is to operate then 22vdc is necessary and that has to be connected externally. The buzzer operates on three volts but, depending on the condition of the wires and the distance, it was sometimes necessary to adjust the "Spring" and the "Gap" of the buzzer for best results. The single earphone was for listening to the buzzer. The bell would operate if the earphone wasn't inserted into the jack. Once everything was connected, the sender would depress the key several times. This would ring the bell at the other end of the line. The receiving operator would insert his earphone and could then hear the buzzer operating as the sender depressed the key. The line is closed when the key is up so when the sender stopped then the receiving operator could send. Wires were connected to L1 and L2. A single wire could be used "L1 to L1" with L2 grounded at both stations. Multiple stations could also be set up in both series connections or with common earth returns. These Telegraph Sets were intended to be temporary communications or somewhat portable considering that the wires did have to be run first. However, the original package also included a canvas carrying bag for the TG-5-A. The implication is that using the TG-5-A assured the communications were somewhat secure since the operators had to be Morse proficient. And, since the reproducer is a buzzer, International Morse is implied. Contract date on this TG-5-A is 1941. 1. "The Vibroplex Co.,Inc." by William R. Holly K1BH - 1990 - Detailed history of Horace Martin, J.E. Albright and the Vibroplex Company. 1. Vibroplex Serial Numbers - WW7P Serial Number Log is at www.vibroplexcollector.net the serial number log is a PDF. 2. 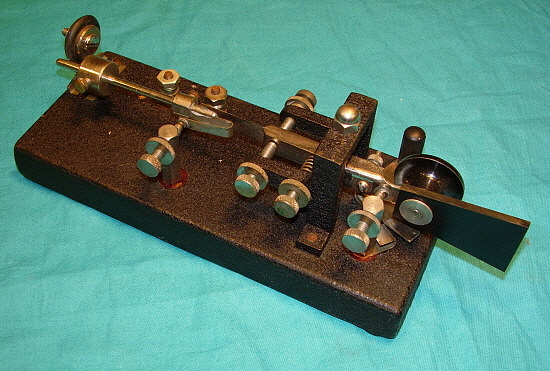 Telegraph Keys - Landline and Radio Keys plus more - www.telegraph-office.com - K5RW Neal McEwen's extensive website devoted to telegraphic codes and instruments. Great reference source. 3. Telegraph Keys of all types - www.w1tp.com - W1TP, Ted Perera's vast website has all types of keys and gear with lots of photos. Includes keys from other collections. Great reference source. 4. T. R. McElroy - World's Champion Telegrapher - www.telegraph-office.com/pages/mcelroy.html has the best information on Ted McElroy. Wikipedia also has some interesting info. 1. New high-quality reproduction parts for most makes and models of speed keys including early Vibroplex, Speed-Ex and McElroy plus some models of hand keys - order directly from their online catalog at www.2bradioparts.com Donnie makes and supplies great quality parts that aren't available anywhere else. Knob and paddle reproductions for early keys can be supplied with a matte-finish for a vintage appearance. NOTE: Donnie will be retiring in June 2019 and will be closing 2B Radio Parts. 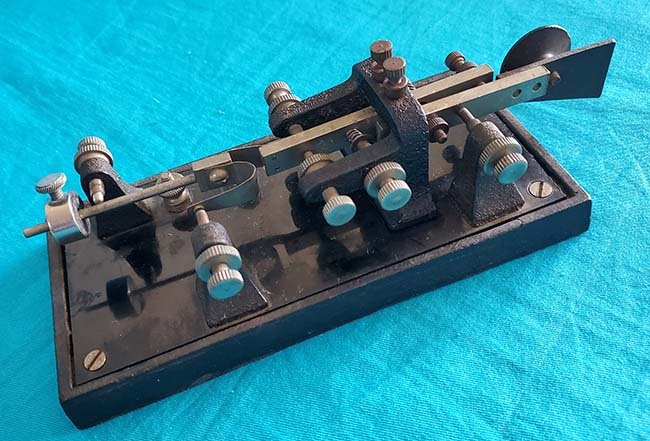 Thanks to all of those hams and key collectors that have contributed information and details on all types of telegraph equipment over the years, either in person or "on the air."